Well I thought I would provide a little information on our Nu-Crank switches. These will allow you to completely hide your power window switches or just keep that factory look. We have 10 different styles of spline and 2 styles of square shafts. These will fit hundreds of different makes and models. The shafts are made of steel and the housings are made from aluminum, no plastic here. Housings have numbers engraved in them that correspond to the wiring harness to make wiring easy. 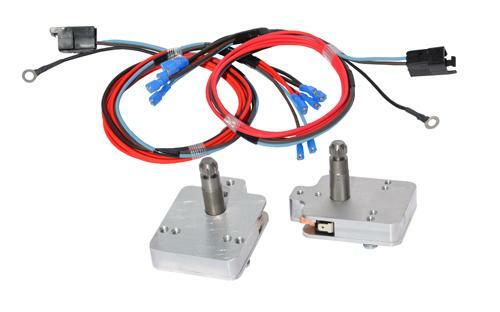 We do provide the wiring harness for these as well. Many people will say "they will just break if someone tries to crank my window down" but the housings are milled out with built in stops so that when engaging the micro switch it can not be crushed or damaged. We also have additional wiring that can be added to put a master switch (usually located under dash or in console) in so the driver doesn't have to lean over to roll down any other windows. The first time someone sees them work it blows their mind! how much? or where to get them? I have them in my wife's 55 Chevy and a buddy's 50 Mercury. Work great and looks original. She didn't want the buttons to operate windows. Picked them up on special. You will need relays too. Edited by Classic Mike on 11-05-18 10:47 AM. Reason for edit: No reason given. Execution time: 0.126 seconds. Total Queries: 18 Zlib Compression is on.